HARLINGEN — Since nobody bothered to make reservations, the cold front which came and stayed this week has tested the area’s only sea turtle hotel. 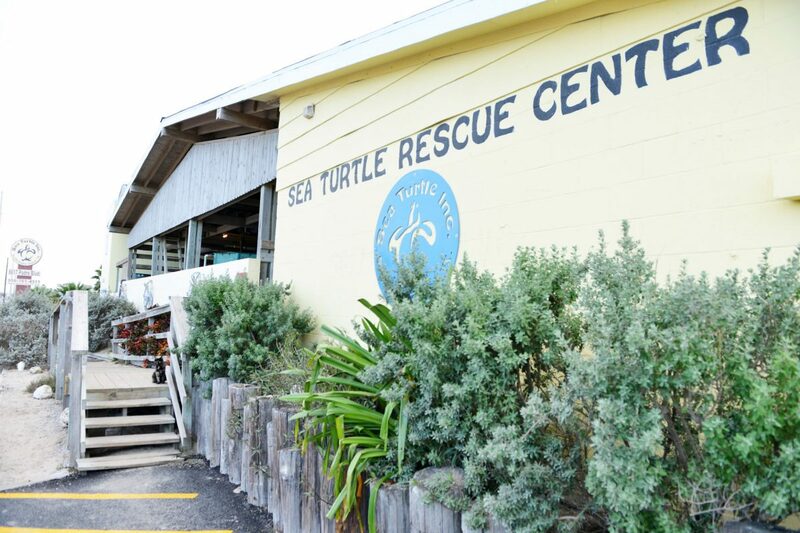 “We’re kind of full to capacity,” Jean Pettit, administrative assistant at Sea Turtle Inc. on South Padre Island, said yesterday. “We received a total, I think, of 267 turtles so far. 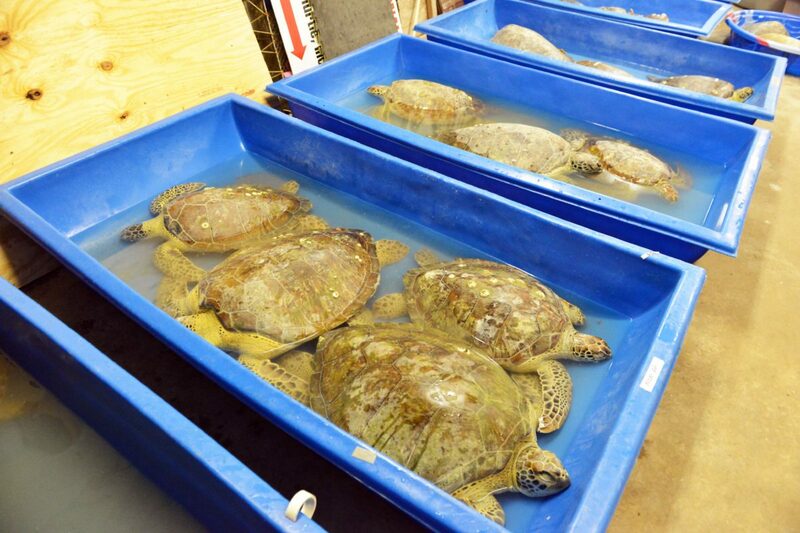 Cold-stunned Atlantic green sea turtles rehabilitate at Sea Turtle Inc. on South Padre Island Friday as the sea turtles are contained in a warm safety room at the facility on SPI. A view of Sea Turtle Inc. Rescue Center facade Friday afternoon on South Padre Island. 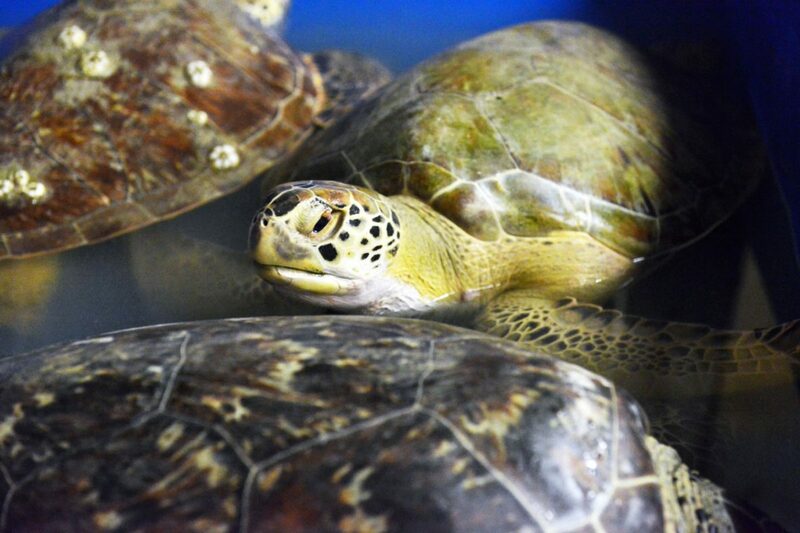 Dozens of cold-stunned Atlantic green sea turtles rehabilitate Friday at Sea Turtle Inc. on South Padre Island. 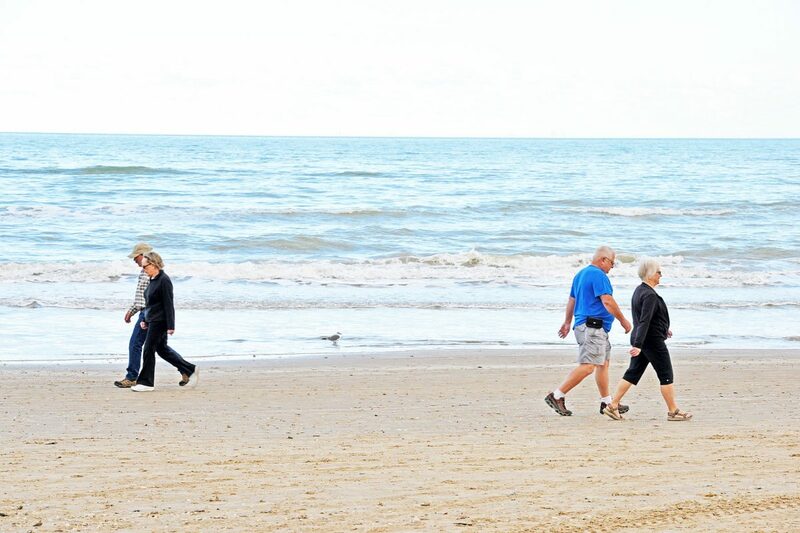 Winter Texans walk along the Gulf of Mexico coastline on South Padre Island Friday as Sea Turtle Inc. on SPI prepare to release dozens of cold-stunned Atlantic green sea turtles Monday on SPI. Most of these cold-stunned turtles are juvenile green sea turtles and are found in the Laguna Madre, where they have gone to feed. But those shallow waters can quickly lose heat when a cold front arrives, and the turtles become stranded when they can’t make it back to warmer gulf waters. At that stage, they become unable to swim and float to the surface where they become vulnerable to boat strikes. Or they may wash ashore and become stranded, and if not rescued quickly, the helpless turtles often die of exposure or predation. “We’re going out to find turtles — this is the third trip out — we’ve gotten 52 and there supposedly are more,” said Boyd Blihovde yesterday morning by phone as he and his team from Laguna Atascosa National Wildlife Refuge drove up to a boat ramp. The refuge manager at Laguna Atascosa said conditions yesterday morning were far better than the previous two days, when his crew had to fight low temperatures and high winds in the Laguna Madre. “It was much worse as far as the temperature of the water and the air temperature and everything,” Blihovde said. “And the wind was pretty bad so the water was churned up and muddy. “Being that the wind was driving some of the water out from around some of the islands, you couldn’t get to some of the turtles because it was so shallow,” he added. But yesterday morning, with the water temperature having risen to 51.2 degrees near South Padre Island and the air temp at 60, Blihovde said his team had an additional weapon in its turtle-rescue armament. Blihovde works for the U.S. Fish and Wildlife Service, which was joined by Texas Game Wardens and Texas Parks and Wildlife Department staff, all scooping up cold-stunned turtles and hauling them to Sea Turtle Inc., Pettit said. “It’s just been an amazing effort with staff, volunteers and the community,” she said. Farther up the Texas coast, around 1,000 cold-stunned turtles have been rescued this week in the area around Corpus Christi and the Padre Island National Seashore on North Padre Island. “We dodged a bullet — Corpus got hit bad — with 700 alone just yesterday,” Pettit said. No. The sea turtles found nesting most often on Padre Island are Kemp’s ridleys, the rarest of the sea turtles, and most of the hatchlings released each year are from Kemp’s ridley nests. 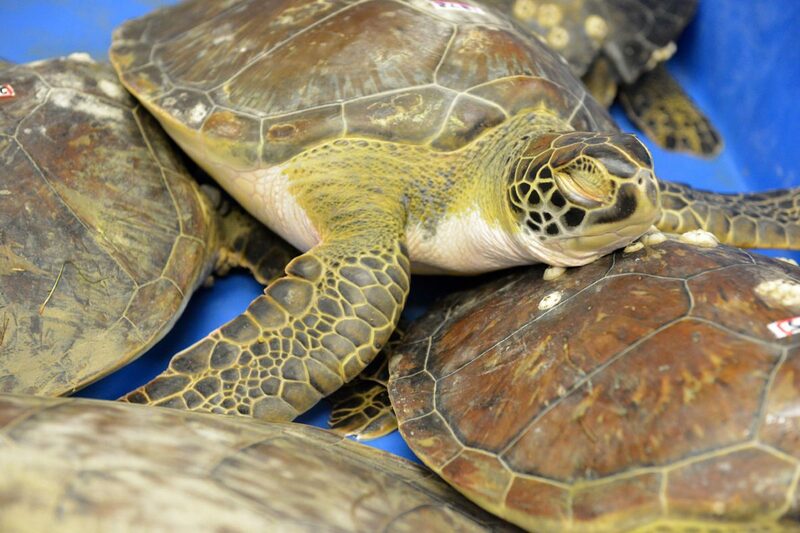 Most of the cold-stunned sea turtles found, however, are juvenile green sea turtles. Green sea turtles do nest on Padre Island in low numbers, but green hatchlings are rarely released during public releases. Where are cold-stunned turtles found, and why? Most cold-stunned sea turtles are found in inshore waters and shorelines along the bays and inlets of the Laguna Madre. This is because the Laguna Madre is shallow, and shallow water can change temperature rapidly. So when a strong cold front passes through the area, it can cause bay water temperatures to drop dramatically. Any sea turtles swimming in those waters may not have enough time to navigate out of the Laguna Madre and into the deeper, warmer waters of the Gulf of Mexico before becoming cold-stunned. The short answer is … food. Green sea turtles are herbivores, eating plants. Their main sources of food in this area are the algae that grow on the rocks lining the area’s jetties, and the sea grasses that grow in the Laguna Madre. In fact, one type of sea grass is called turtle grass. For these green sea turtles to find enough of the right foods to eat, they have to enter the inshore waters of the Laguna Madre.